Owned by Julia and Liam in Melbourne. Julia in Victoria owns Noonbarra Attila. 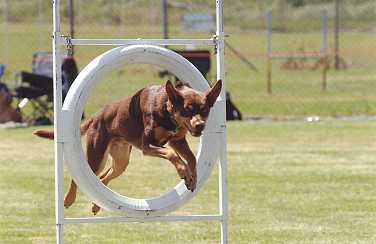 He was bought to compete in the dog sport of Agility. She has given us plenty of feedback on Atilla and we are very grateful. 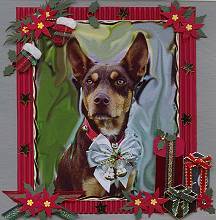 She has sent us a beautifully framed photo of him which is now in our lounge room. She also sent us his own little photo album, which we thought was a lovely gesture. We also got a lovely card from the family. We proudly show these things off to our friends and other customers. 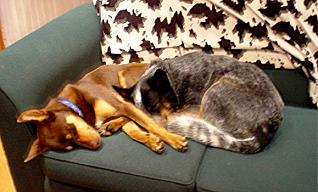 Julia and her family has gone to so much trouble and are clearly very much in love with their new Kelpie. She still keeps us updated with his progress with an occasional email or telephone call. 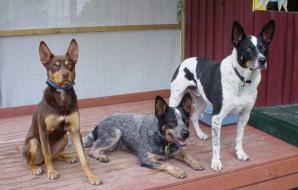 It is nice to have customers like Julia that care so much for their dogs and are prepared to put the time into them. He has started puppy playgroup at the local Vet Clinic and will start puppy classes at our Obedience Club in about 3 weeks. He goes down to socialise when we take our other two to Obedience and everyone loves him and can't believe what he has learned so far. (I've had two instructors ask if I will take their puppies for a week and train them, although I suspect it's him, not my training!!) He gets lots of pats from people when I take him into town and reacts well to the attention. 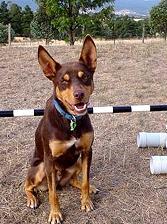 The 'old timer' at the local stockfeed store has also had a good look at him and pronounced him 'the best bred Kelpie I've ever seen'. Our Vet was very impressed with the folder that you sent with Atilla and his wife couldn't wait to check out your website. They are now planning on getting a Kelpie some time in the next 12 months or so as they have a small number of sheep and are looking to expand. 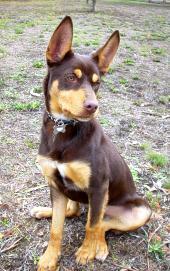 He's getting on great with my Kelpie X. .... Just wanted you to know what a great choice you made and how much we love him. You must have ESP......I am just in the process of putting together a little package for you with some new photos and lots of information about the little one. I'll keep this email short at the risk of repeating what I've already written but to sum it up he is ABSOLUTELY WONDERFUL so far ! Have only done informal 'play' training in both obedience and agility but the speed at which he learns is astounding and he is absolutely obsessed with agility equipment ! We play games with the tunnel and the tyre on the ground and although he's too young to do any jumping training I've seen his style when he's taken off and launched himself over anything lying on the ground that he can find outside. PS: He's been very well behaved for me so far, but he tries Liam out which is funny for me to watch as I can really see a difference in the way he responds to us. Thanks again for everything and for caring so much about him to ask ! Just wanted you to know what a great choice you made and how much we love him. Just downloading Atilla's latest photos into the computer and thought I would send you a couple - taken very quickly, as we may have mastered the sit stay at obedience, but we still haven't mastered it with the distraction of a camera pointed in our face ! He is just absolutely beautiful in every way - starring in puppy class at obedience, can sequence 4 or 5 'baby obstacles' off lead in agility 'play training' and also has a lovely affectionate nature. 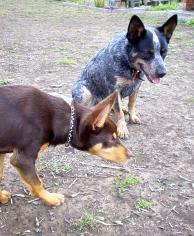 As you can see from the photos he can also play with Bosnich (Cattledog) now without having his head ripped off - breakthrough ! Take care and give Dusty and Cassie an extra big hug from me for producing such a fantastic little boy! He has adapted so quickly and easily to life here that I almost can't remember not having him around. He is an absolute darling and he loves learning new things. I have tried to make training into a game for him, using a clicker, toys and food rewards and this has worked well. So far he has sit, drop, stay (briefly) recall, stand (almost!) and he heels off lead over a short distance. I am now trying to transfer this to lead. I won't do formal agility training with him for a while as I want him to have basic obedience commands (with distractions!) first, but we'll play 'agility games' together and he runs through the tunnel, negotiates a small puppy A frame (about 60cm high) onto a deck and jumps poles on the ground. He loves to jump and would attempt much higher things if I let him. He also goes through a tyre on the ground with no problems. He loves these 'agility' games more than anything else and judging by the speed at which he has learned other commands, I think I could also trial him at obedience fairly successfully - although I am not planning to at this stage. "Here is a little memento of Atilla's first few Agility trials - to say he has exceeded expectations so far is an understatement. We began ANKC (main flavour of Agility here) in October as I decided just to run the last 3 or 4 trials of the year to see how our 'teamwork' stood up in a trial situation. In his first Agility run, he not only gained a pass but won the ring and ran close to 22 seconds under the standard course time. Next trial he gained another Agility pass/3rd place and the following trial we got our first jumping pass/2nd place. He also got his first title in October - not Agility or Jumping but herding! 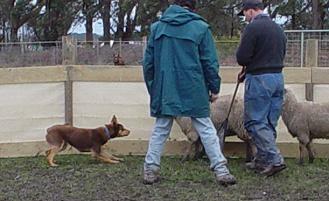 He passed both legs of his herding instinct test. He is now listed as Noonbarra Atilla H.I.T. Of course Liam thinks it's great as he handled him to his first title and not me! Everywhere I go I get so many people ask me where I got him - I'm always happy to tell them! (and to pass on a card if I have one handy). Better than any Agility/Trialling performance is what an absolutely great dog he is! Smart, affectionate, obedient (most of the time) and just a great companion around the house. It is a privilege to own him and I consider myself so lucky that you chose him for me. The qualities that you are promoting in your breeding program are such a credit to you both - big pat on the back guys and I definitely want to own another Noonbarra Kelpie in the future.- although at the moment I feel I have my 'dog of a lifetime' here at my feet right now. Atilla is sleeping at my feet at the moment. I have noticed a slight change in him just over the past week, he seems to have become a lot more attentive (not that he wasn't before) and is following me everywhere. He is doing really well in Obedience class, I'm sure he would be doing even better if I wasn't off trialling most weekends so that he actually got to go more regularly ! I feel really bad about this. Later this year I will start him in beginner's Agility class. 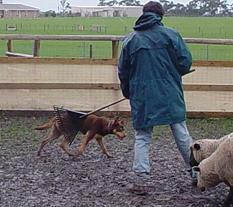 I'm not in a huge hurry to do this as there is so much foundation training that he can do that doesn't involve equipment , have also seen a lot of people ruin very young dogs from starting too early and expecting too much from them, an easy trap to fall into with him, because he's just so good ! The agility training he's been doing here (uprights with poles on ground, tyre on ground, tunnels, small A frame, ) has been amazing. I can already put him on a stay and get a 2 jump lead out - I can't even do that with my titled dog ! Will try to get some photos of his 'agility training' and email them at a later date. I know I'm repeating myself when I keep saying how beautiful he is, but he's just such an incredible boy ! 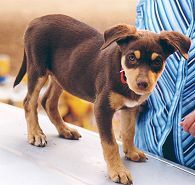 Thank you again, for choosing him for me and for staying in touch, you've turned me into a 'Kelpie addict' ...I even joined the Working Kelpie club and I have a kelpie sticker on my new car - stickers were going to be banned on the new car and I lasted 4 weeks ! just thought I'd drop you a quick email regarding Atilla's progress - it seems like yesterday that he was a cute, plump little puppy with ears that defied gravity, suddenly he's a handsome, athletic looking 10 month old with legs that just go on forever! I took him with me when I trialled Yasser a couple of weeks ago and Denise Agnew had her kelpies there in the car while she was judging so it was great to see them on the cover and then Atilla on the inside. He is still progressing well at obedience, when I actually get there. (He has 3 pass up ribbons so far) I have taken him to two agility classes now and he was absolutely awesome ! He just seems to have an innate knowledge of what to do. I am only taking him to agility class once a month at the moment, as I still want to do foundation training here without so many distractions. 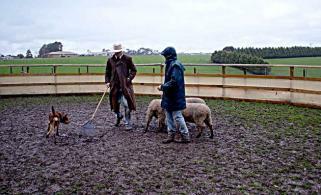 We did a herding workshop with Paul McPhail a few weeks ago. 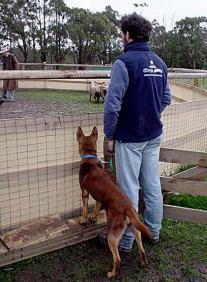 He was very interested in Atilla as he said that lately he has worked with quite a few Noonbarra dogs. Said he had loads of instinct! At first in the yard he tended to get very close to the sheep but by the time he got out in the paddock he was starting to get the hang of it (for a first time anyway) He was just so excited at first that he was racing around the sheep in big circles, then at the end it was like the penny started to drop. I don't know that much about herding, but there were a few people there who have been having lessons for most of the year and they all came up at the end and said, 'you must be really happy with the way your kelpie worked ' so we took that as a compliment! We will probably try and organise a private lesson some time as it was great fun but pouring rain the whole day and more mud than I've ever seen! I have included some photos, not great due to the weather conditions but thought you might like to see them anyway. He is absolutely starring at agility. First week back after the break he got promoted to Class 2 (Intermediate) spent 2 weeks there and has now been promoted to Class 3 (novice trialling class) . 6 months or more in class 2 is usual. I have also been invited to become an agility instructor, I'm sure it's only because Atilla is making me look good - guide dog for the agility impaired ! If you're still planning on those baseball caps, please let me know as I would love to order one. Hi Mary & Stephen, just wanted to update you on Atilla - we entered our first agility trial yesterday, a NADAC trial at Bacchus Marsh. Did this one more as a test as I wanted to see where we were at and what I needed to focus on in training. We had six runs, three passes, two first places (agility) and one second place (jumping) so I was certainly pleased with the outcome! Nearly had our jumping title in a day, but on the jumping run that he didn't qualify on, he got to the last jump and saw people/dogs he knows outside the ring in direct line with the finish so he bypassed the last jump and ran off to socialise with them instead, ran beautiful up to that point, I actually consider that a better run than the one we qualified on. No more trials for another few weeks so we can work harder on proofing for distractions! I am so proud of him, he never broke one stay at the start line and got every single contact (colours he has to touch at the bottom of dog walk, seesaw and A frame, without jumping off early, a common problem with 'high drive' dogs) and weaved perfectly in every agility run. There was a photographer at the trial so I am hoping to see some proofs when I run Yasser in a few weeks, will send you a photo so you can see him 'in action' if there is a good one. Have enclosed a couple taken at Casterton this year, as you can see he took quite a shine to the statue in the main street. Hope everything is going well at Noonbarra, would LOVE another puppy but I have to talk Liam into it first, maybe next year some time ??????? 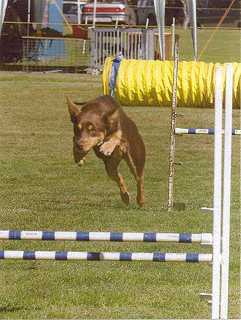 "He is continuing to be a little star in Agility - I just have to get my act together and stop costing him clear runs! He finished both his Novice titles (Agility and Jumping) over the Easter weekend. We had a great day on Saturday, 4 runs, 4 passes, plus the club member's sashes for fastest qualifying Agility run and fastest qualifying Jumping run.... At the end of the day we also won the club member's sash for 'Best Performing Dog at Trial', without even competing on the 2nd day. The Open is harder (for me - not him) but he got his first Agility pass last weekend and 2nd place (0.03 seconds off 1st). He also has a new 'best friend' at trials - little Noonbarra Bob. It's funny to see them together, they seem to understand they're part of the big 'Noonbarra family' and seek each other out. 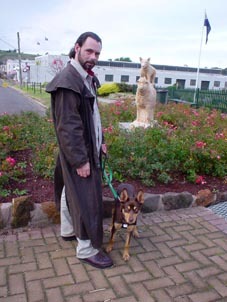 I was in NSW for a seminar a few months ago and had several people ask me if I knew Noonbarra Matilda. ..thanks again for my special boy. - Julia and Atilla. "Mary and Stephen, It's been extremely hot and humid here in Japan. Lady has been doing pretty good in this weather and she now likes water very much. So we often take her to the beaches and rivers. She can swim pretty well! I went to Melbourne last week only for a week to catch up with my friends. I really wanted to visit your stud to meet you and Lady's parents, but I didn't have enough time to do that unfortunately. 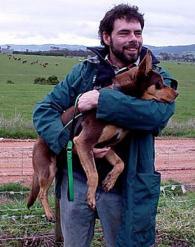 One Saturday, I went to see an agility trial in Heidelberg and I met a woman who had a good looking Kelpie. 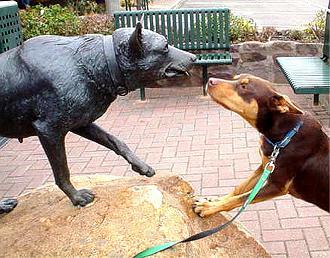 I asked her where she got that kelpie and found out that he came from your stud!!! No wonder he looked familiar to me! I forgot his name..... something like Atilla or something.... anyway, she, the owner said that she spoke to you a few weeks ago. You might know who I am talking about? 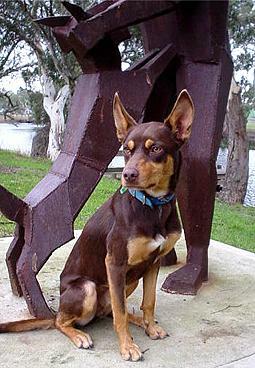 Anyway, I was so happy to meet the kelpie that are from your stud and I just wanted to tell you. I hope to see you next year!!! So he has certainly made up for lost time with his jumping. We need one more agility pass (need 5 all up and we have 4) for his ADX. If I can just get my act together and stop stuffing him up !